Boost Pro is an all-in-one audio finalizing utility with six independent effects each utilizing advanced, automatable, parameter control. Every effect module has a mid/side processing option, comprehensive RMS metering, dedicated low-latency mode, CPU optimized performance and text-editable fields. From simple mix-down lift to full mastering solution, vocal chain or live instrument processor - the list of applications are endless. Easily bypass effect sections, browse 100 multi-genre presets and re-order compression/EQ for extra sonic character. 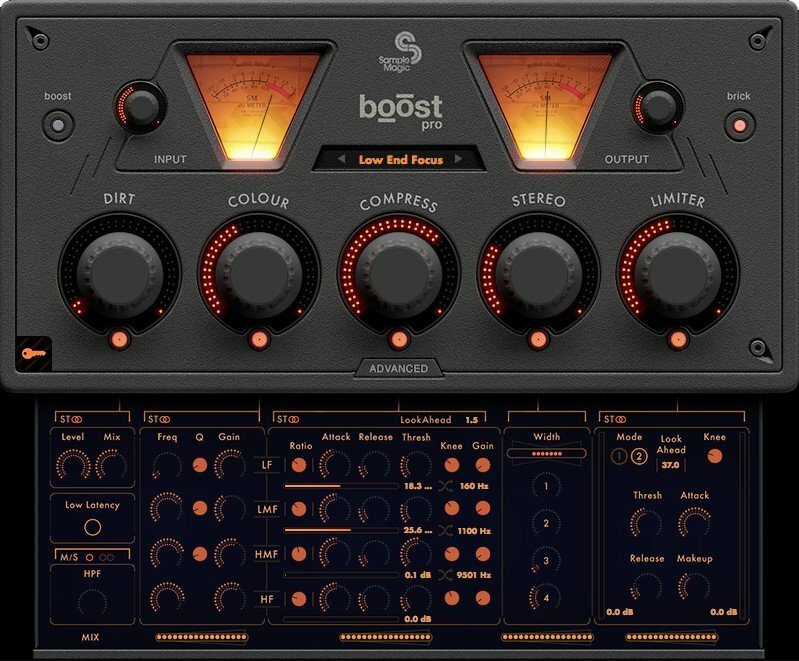 Utilizing cutting-edge low-latency DSP, Boost Pro provides distortion, multi-band compression, 4-band equalization, stereo enhancement, brick wall limiter and hi-pass filter all in one easy-to-use plug-in for a variety of audio applications. Boost Pro provides many additional professional features from the original Boost plug-in. With full control over mid/side parameters, every module within Boost Pro can be applied to the stereo signal, middle or sides at the simple click of a button. The individual level of each effect can be easily adjusted using the elegant macro knobs, for quick on-the-fly tweaks, or parallel processed using the advanced controls for classically styled compression models and limiting. Stylish VU meters give visual control over all processes. Not just for the mix buss, place it on a muddy drum track for meaty width and energetic flare, give vocals a multi dimensional stereo edge, remaster old productions, fix live performances, DJ mixes and voice-overs. Get Foley broadcast ready, redefine mid-range and make cumbersome, CPU-intensive processing a figment of the past. Enter values at the click of a mouse, keyboard, automate or simply tweak. Enjoy complete control over six independent processes. 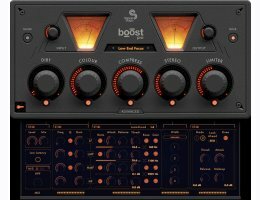 From mix warmth, techno kicks to full-on guitar grit, Boost Pro’s ‘Dirt’ processor gives access to a variety of applications. Be warned! With adjustable frequency bands for low, mid, high-mid and high frequencies, Boost Pro’s comprehensive EQ allows individual Q and gain settings for each band. From subtle to slam, adjust look-ahead, compression frequency bands, threshold, attack, release, knee and gain for each of the 4-bands. With full RMS metering for each frequency band. With full control over 4 haas bands and width, adjust the stereo field of the audio. Widen the elements of a mix or enhance old stereo recordings, with just a few simple controls. Powerful compression and peak limiting processor with full attack, release, knee, threshold parameters and metering. Capable of transparently ‘shaving off ’ a few dB to decimated a mix-down - for maximum impact - while still maintaining clarity. Hi-pass filtering for removing clutter from the stereo mix or sides from 0Hz to 1.2kHz. Plugivery is an official distributor for all Sample Magic's products.